Join the X-Fidos for beginner flyball class! Is your dog an endless tornado of energy? Do you have to hide tennis balls in your own home? Don't worry, there's hope! Beginner class is held on Sunday mornings at Happy Go Lucky Dog Training before our regular team practices. No previous flyball experience is necessary. For class schedule or to sign up, email xfidosflyball@gmail.com. Six foot leash. No flexi leads, please. New handlers may try a class at no charge. A $120 one-time fee covers all subsequent classes until you graduate to team practices. Most dogs need at least several months of weekly classes before graduating, but dogs learn differently and at different speeds. It may take 6 months or more of training before a dog is ready to join the team at practice. Dogs must be current on vaccinations and in good health. Dogs are to be kept on leash at all times before, during, and after class unless performing exercises as directed by the instructor. Dogs must be non-aggressive towards people and other dogs, and not leash-reactive. Dogs should have basic obedience skills and be comfortable interacting with strangers. Before graduating to team work, dogs must be comfortable waiting for a training turn in a crate or pen. Junior handlers (handlers under 16) are welcome with a parent's permission. We believe in positive, rewards-based, and force-free training. We do not condone the use of prong collars, electric collars, or other punishment-based training tools. We seek to find each dog's motivation, make flyball class a fun and exciting place, and work with dog and handler to set both up for success. In response to unwanted dog behavior, we may sometimes ask a handler and dog to take a brief time out to reset. Wow, this looks complicated! Can my dog really learn to play flyball? Many dogs can be taught to run the flyball course, and all breeds, sizes, and abilities are welcome on our team. Currently, flyball is the only team sport for dogs. The dogs must work in rather close quarters with other excited dogs. As flyball is a noisy and exciting sport, it may be too intense for some dogs. Aggression issues are not tolerated by our club or by NAFA regulations. Our goal is to ensure that all dogs on our team are happy, safe, and LOVE the sport. My dog weighs less than twenty pounds. Can little dogs play flyball? Absolutely! Jumps are always set to a height appropriate to that of the dog, and we have multiple pint-sized pups on the X-Fidos. That being said, if you have concerns, it’s a good idea to chat with your vet before getting started. My dog is the size of a small pony. Can big dogs play flyball? Absolutely! Big dogs, little dogs, and medium-sized dogs all play flyball. That being said, if you have concerns, it’s a good idea to chat with your vet before getting started. 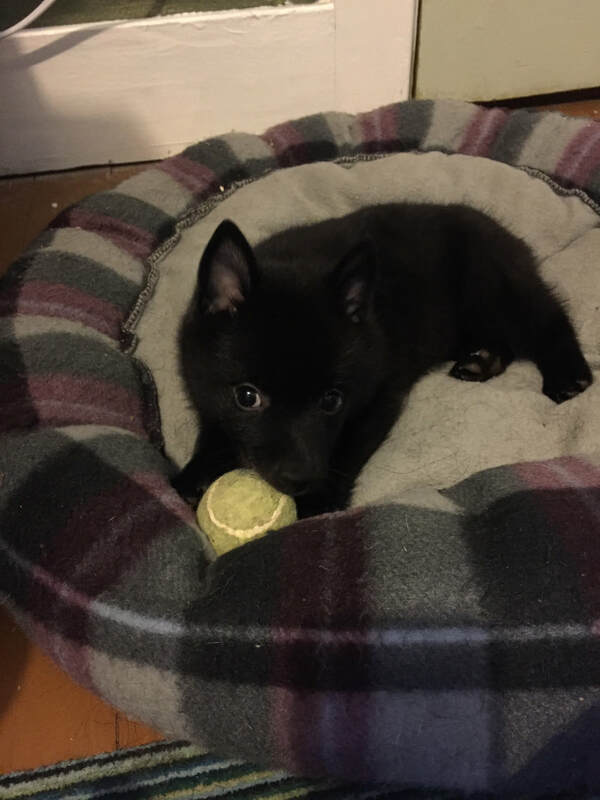 Can I bring my puppy to beginner classes? While it’s not developmentally appropriate or safe for young puppies to learn the full flyball course, there are lots of fundamental flyball skills they can work on before they learn to race with the big dogs. Email us to discuss further. Flyball sounds awesome but I think my dog isn’t quite ready for beginner classes yet. What sorts of skills can we work on in the meantime? Basic obedience skills, especially recall (come) and socialization with new dogs and new humans. Play wall ball. Find a wall or closed door. Bounce a ball on the floor so that it ricochets off the wall for your dog to catch. Reward and praise if they succeed. If your dog struggles to catch a ball, practice tossing popcorn or small treats for them to catch mid-air. Crate training. At team practice and tournaments, flyball dogs rest in their crates between races. Your dog should be comfortable and able to relax in its crate. Wait a second, are there prizes to be had? 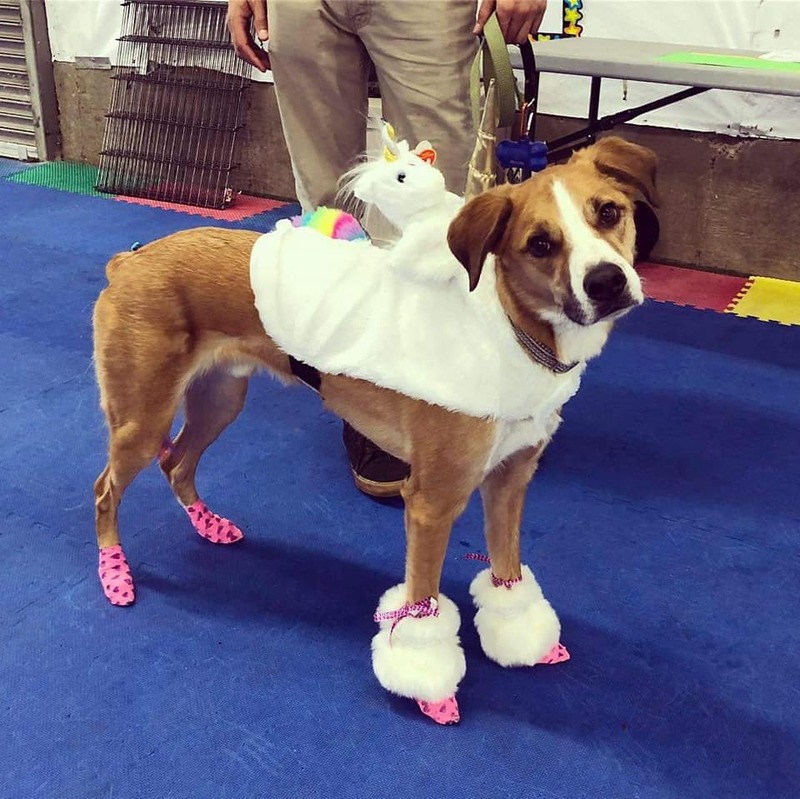 Can my dog win big? Dog teams running in flyball tournaments can score points by finishing each race under a time limit - up to 25 points per dog per race. Points are cumulative over the racing career of each dog, and titles are awarded at various point milestones. As dogs earn more advanced titles, pins and plaques are awarded by NAFA. Our top point-earning dog Pi has over 52,000 points! In addition to titles, sometimes a tournament will have fun prizes and swag! 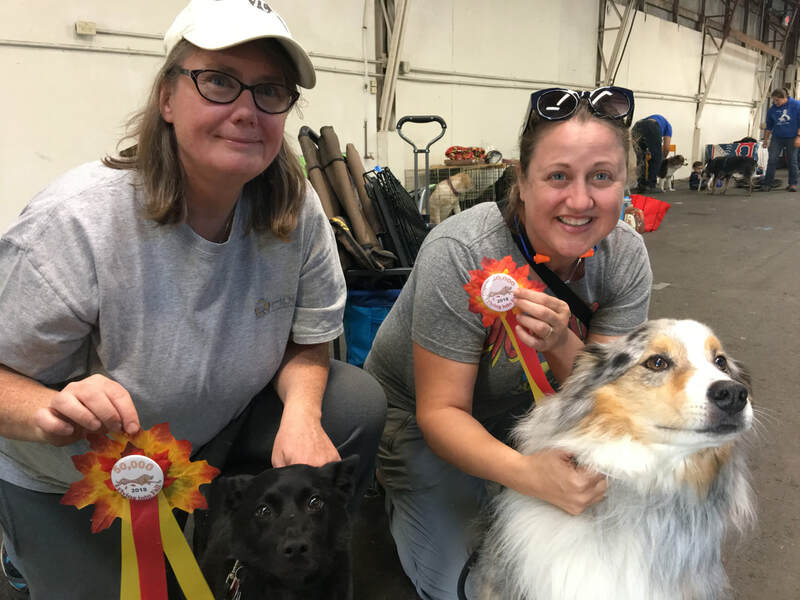 While points and prizes are a fun way to take pride in our dogs' accomplishments, we ultimately love flyball for its unique blend of athletic skills and the way it strengthens the bonds between dog and handler.